At the beginning of this series I said that the fact that carbon can form rings leads to all kinds of interesting consequences. We’re going to see many examples of that in our post today! So far, we’ve only talked about cyclic molecules containing one ring. But, of course, molecules with multiple rings are very common in nature. A prime example is the steroid structure, exemplified by the common oral contraceptive ethinyl estradiol. Here, we’re just going to talk about two very simple cases of molecules containing two rings. We’re going to focus our efforts on cyclohexane, and examine in close detail the situation where two cyclohexane rings are bonded to each other in the most common way – with the two ring junctions (“bridgeheads”) on adjacent carbons, a situation we refer to as fused rings. The parent molecule is called “decalin” since there are ten carbons in total. However, remember that any time we have two substituents on a cyclohexane ring (as we do here), it is essential to draw in the stereochemistry in order to avoid ambiguity! Two stereoisomers are possible here: one where the hydrogens at both ring junctions are “cis”, and the other where they are “trans”. These molecules look so simple when we draw them on paper! What could be simpler than two hexagons joined together? 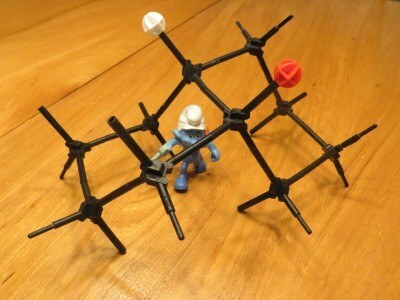 Well, just like with cyclohexane itself, the complexity comes when we examine their most stable three-dimensional structures. Each six membered ring will adopt a chair conformation. Believe it or not, the cis and trans stereoisomers of decalin have remarkably different shapes. There’s no better way to see this than by making a model. I love Vine for making movies of what it’s like to “fly-over” these molecules. Here’s cis-decalin. The hydrogens on the “bridgeheads” are highlighted in red and white. 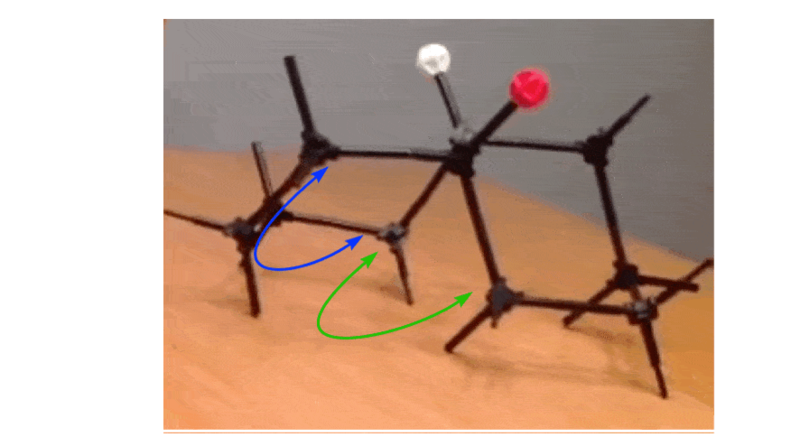 Notice how both cyclohexanes are in chair conformations, but the molecule adopts almost a tent-like shape. And here’s trans-decalin. As we look at the molecule from an angle, it’s obvious that both cyclohexane rings are also in the chair conformation, but the molecule is much flatter overall. What about trans-decalin? Shouldn’t a ring flip convert both equatorial groups to axial groups, and therefore be higher in energy? In theory, it’s reasonable to think, “yes” – and in situation where we’re dealing with rings larger than 8 or so, that is what happens. However, this is a prime example of an unexpected consequences I was talking about earlier. 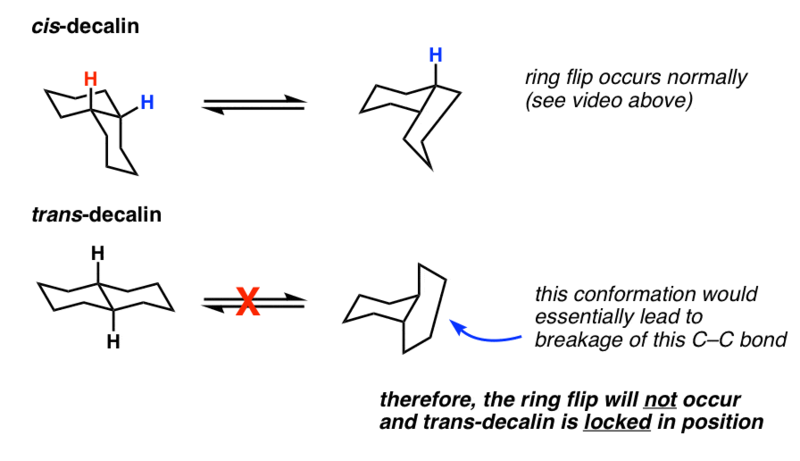 It turns out that a ring flip in trans-decalin isn’t possible because it would lead to too much ring strain. To use an analogy, the reason why trans-decalin can’t do a ring flip is a bit like why you can’t touch your nose to your spine – there just isn’t enough flexibility to do so without putting yourself in tremendous pain. A different way of saying the same thing is that trans-decalin is locked in position. So while cis-decalin can undergo ring flips, trans-decalin cannot. In the next post we’ll talk a little bit about some other situations that arise when we have molecules with multiple rings. The ‘tent-like’ shape of cis decalin (see pic below) has a further important consequence that has been exploited by clever organic chemists for decades. The two faces of cis-decalin are not equivalent. The top face is more “exposed” to the surrounding environment than is the bottom face – in other words, a molecule encounters much less steric hindrance in approaching the top face than it does the bottom face (note how crowded the underside is). An example will serve to illustrate. 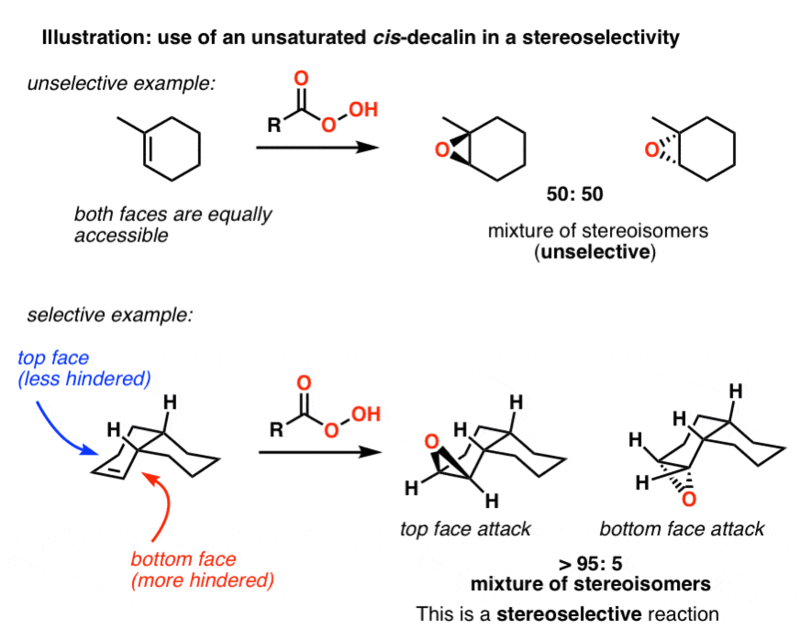 If we have a decalin with an alkene, such as the molecule shown below, one face will be more reactive than the other because it is more accessible [in order to react at the bottom face, the peroxyacid would encounter significantly more steric hindrance]. For a classic example of how this can be used in target molecule synthesis, see Woodward’s synthesis of reserpine. Bro the video doesn’t help.